"In After McDonaldization, John Drane argues that the continuing impact of globalization and consumerism has been joined by a post-9/11 culture of fear and a search for truth. He asks what it means to be Christian in a post-Christendom context. Where are today's mission opportunities, the places where God is at work? In our fragmented society, how should Christian community be shaped? And what values might inspire the leaders of the twenty-first century?" "As he addresses key questions for Western Christianity in a global context, Drane presents a case for a more practical theology, are invigorated style of ministry, and a restatement of classic Christian beliefs for the twenty-first century." --BOOK JACKET. - Publisher The decline in church attendance continues in the US and Europe, yet increasing numbers of people are turning to 'spirituality'; the continuing impact of globalization and consumerism has been joined by a post-9/11 culture of fear and a search for truth. 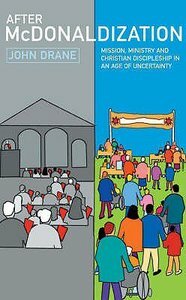 In this sequel to the hugely influential The McDonaldization of the Church, John Drane considers what must come next for the Church. He presents the case for a more 'practical theology', a reinvigorated style of ministry and the restatement of classic Christian beliefs for the 21st century; not just as 'things to believe' but 'values to live by'. The decline in church attendance continues in the US and Europe, yet increasing numbers of people are turning to 'spirituality'; the continuing impact of globalization and consumerism has been joined by a post-9/11 culture of fear and a search for truth. In this sequel to the hugely influential The McDonaldization of the Church, John Drane considers what must come next for the Church. He presents the case for a more 'practical theology', a reinvigorated style of ministry and the restatement of classic Christian beliefs for the 21st century; not just as 'things to believe' but 'values to live by'.